By the end of the next century, the “greenhouse effect” may increase temperatures worldwide to levels that have not been reached for at least 100,000 years. And the effects on sea level and on agriculture and other human activities are likely to be so profound that we should be planning for them now. In 'Temperatures Rise in the Global Greenhouse', New Scientist (15 May 1986), 110, No. 1508, 32. 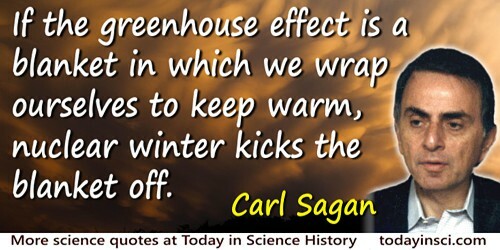 If the greenhouse effect is a blanket in which we wrap ourselves to keep warm, nuclear winter kicks the blanket off. A Path Where No Man Thought: Nuclear Winter and the End of the Arms Race (1990), 24.